The Hong Kong Herbarium is the most comprehensive herbarium in Hong Kong. There are approximately 45,100 plant specimens for examination. The collection includes vascular plants (ferns, gymnosperms and angiosperms) collected mainly in Hong Kong, Southern China and other countries of Southeast Asia. Within the collection, there are many historical specimens which are more than 100 years old. 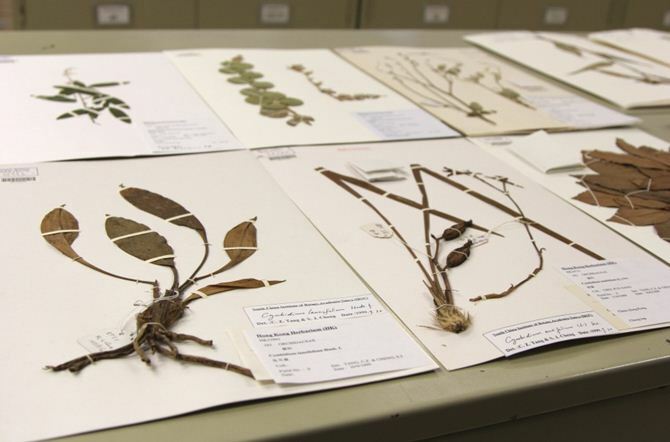 More importantly, there are about 300 type specimens (the specimens which were described and used for the designation of new species) making the Herbarium regionally important. Please visit Type Specimens for more details. In the Herbarium, the arrangement of the plant specimens of the ferns follows the system of R. C. Ching (1978); that of the gymnosperms follows Kubitzki (1990); and that of angiosperms follows Cronquist (1988). The plant specimens are pressed and treated under low temperature at -30℃ for 72 hours. They are then mounted and identified before they are stored in the steel cabinets in the Herbarium which are under 24 hours temperature and humidity control.